Another fine day of blogging is under the collective belt of the TopRank team. Google Dance offered a very nice distraction last night and you can see by a quick search on Flickr the fun that was had. Thank you Google. The revelry will be amped up this evening with the SearchBash event sponsored by WebmasterRadio.FM, PRWeb, BruceClay and Moniker. 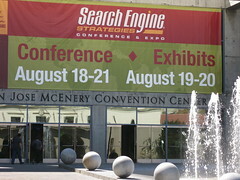 Hey there, I sat in on the “Successful Tactics for Social Media Optimization” session and was very impressed. I am wondering if anyone from your organization might have a couple minutes sometime thursday to help clarify a couple things for me. please let me know asap to make arrangements.